How are you today? How r you are doing awesome. Today, I would like to share with you about something super interesting and it will change the way you opt for entertainment. Have you heard about Bento TV? Ya.. Bento, I am not talking about the cute Japanese lunch box. So whats is this Bento TV all about and what make it interesting? Bento Live is a completely LEGAL online video service provider in Malaysia that offers streaming on-demand videos of Movies, TV shows, Animations, Webisodes and Trailers from networks and studios in the United States, Japan, India, Indonesia and Malaysia. Our goal is to make a difference to the film industry by moving viewers away from illegal downloads and ensuring filmmakers receive their well-deserved compensation. Every time a viewer watches a program on bentolive.com, most of the profits goes to the hardworking men and women producing the content. In other words, no more searching high and low on the internet for movie streaming links since it is legal. Yes, LEGAL. I dont know about you, but sometime when I just want to chillax at the comfort of my own home and enjoy movie via streaming (okay, no one I know watch movie via dvd or cd nowdays hahaha..) So, I have to go search for links for movie links. Sometime, it is a phishing website and sometime it only show portion of the movie.. what a turn off right? Imagine how happy I am now that there is a legal side that I can just go and search for any movie I would like to watch and it is worry free! So how can you enjoy Bento TV as well? Have a laptop or Smart TV? All you need to do is go to Bentolive.com and login. As simple as that and you are now in the world of endless worry free and awesome entertainment. Anyway, Please take note that you need internet connection for this ya..
Just incase you went travelling (ofcos you didnt bring your heavy tv right? hahaha) or went out to see your friend and your friend is being super late and you just need to kill time, you can also enjoy Bento TV via your phone and tablet. Nice right? All you need to do is download the apps via apps world (one time minimum charges of RM6.50 for non-samsung user) and if you are a Samsung user, good news! you may download it free from Samsung Apps. Not just movies, this Bento Live Apps also offered documentaries, tv series and anime. You can always invite your friends and family to enjoy and have a quality time together without the need of going out. Talking about TV series and anime, well some honestly I do watch some Korean TV series. How can I resist?? hahaha… If you are a fan Korean Drama or Spanish telenovela, there is a good news for you! This apps allow you to enjoy your session with English and Bahasa Malaysia subtitles. So what kind of movie Bento TV offered? Quite a lot. Check out below for some of the movie in their database. Whats your favourite movie? 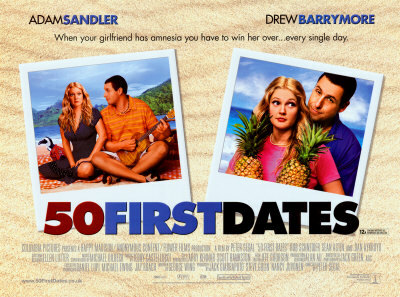 My ultimate favourite movie that I could watch over and over again is the everlasting romantic comedy acted by Adam Sandler and Drew Barrymore non other that 50 First Date. I love this movie so much and found that these 2 actors are super adorable.Love the plot and the storyline so much. Anyway, do you know that Bento TV is currently hosting a contest? Well, if you do fancy to win a 40 inch Samsung Smart TV (who don’t right? I know I want one!!). There will be 2 units up for grab once a month. Hollywood loves a remake, as in theory it's less of a gamble – if a film was successful before, then it should be again. As this list says, most of the times, this approach works.